A spectacular view of the approach to Waterloo Station as 43015 tails 43031 on 1O42 08:45 Penzance to London Waterloo. More regular traction is passing in the shape of 450074 with a South West Trains service. 6th April 2015.
before working 1V73, the 1207 London Waterloo to Penzance. 43025 was on the rear of the train. 6th April 2015. Over the 2015 Easter weekend (and also Sunday 13th April) all lines in the Reading area were closed to allow the final stages of the station remodelling to take place. 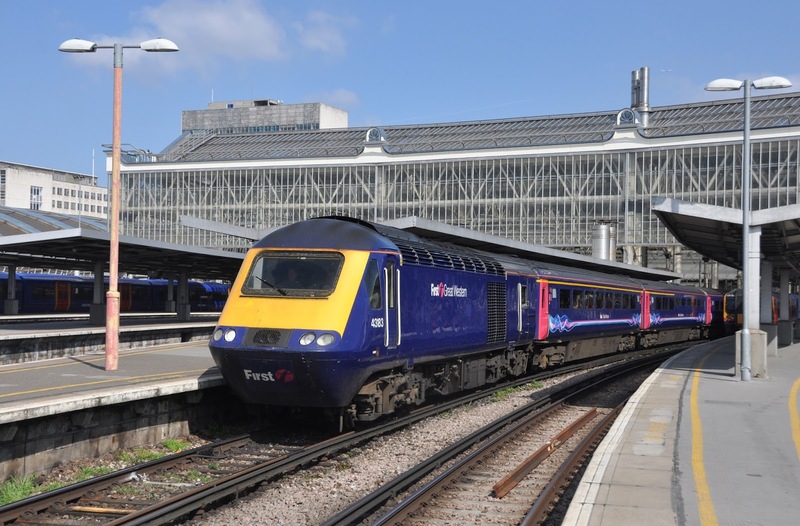 As had happened two years previously FGW services to the west country were diverted between Westbury and London travelling via the SWML through Salisbury, Basingstoke and terminating at London Waterloo. This offered the rare chance to see and travel on the iconic HST's over southern region metals. 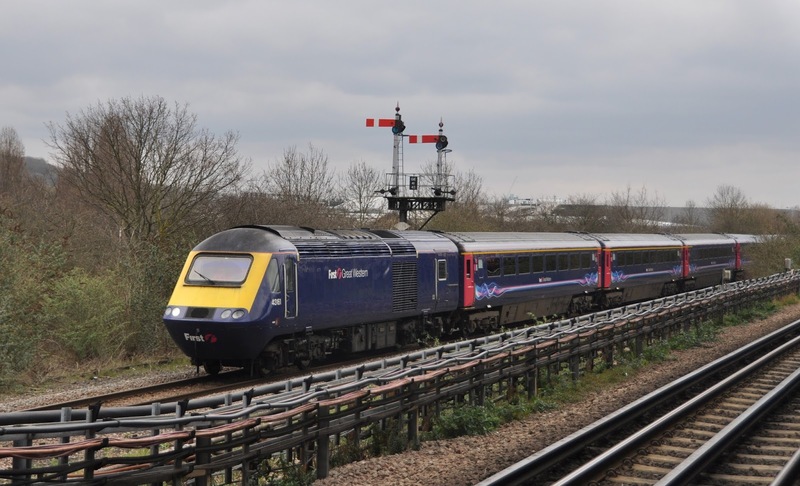 With the final stage of the Reading upgrade works now complete it is unknown if HST's will traverse this route again- especially with the pending introduction of the Intercity Express class 800's on the Great Western route. 43071 & 43032 on a late running 1O44 the 1044 from Penzance. 6th April 2015. 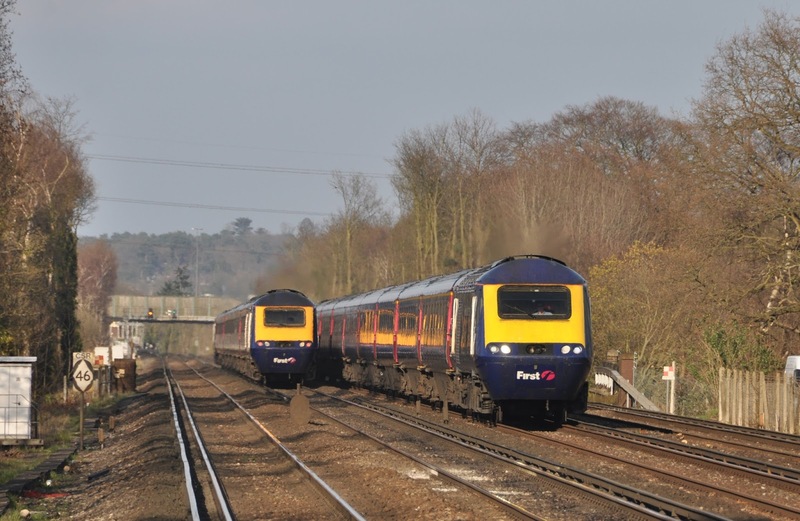 As well as diversions via the SWML, HST's were also running out of Paddington and then via the Chiltern main line to Banbury in order to avoid the works at Reading. Trains to both Bristol (via Bath) and to South Wales were using this route. 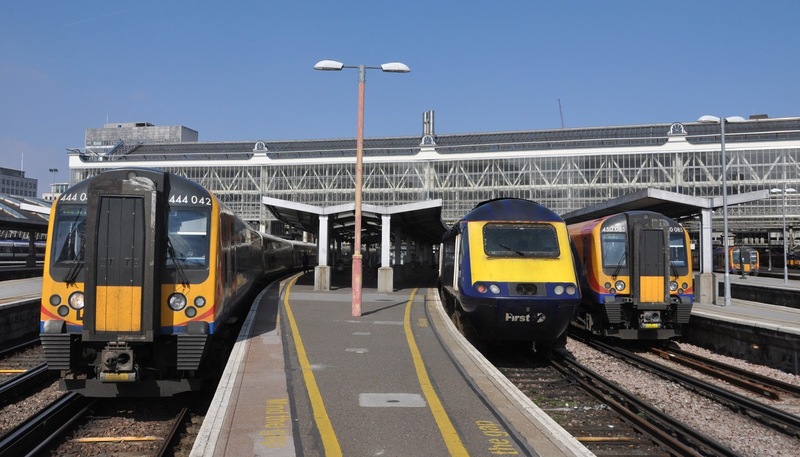 Between Paddington and the Chiltern line HST's travelled via the single line Park Royal branch affording the chance to see HST's alongside traditional semaphore signals in the London area. Stranger at Waterloo- 43028 shares the station with the more usual crowd of class 450 and class 444 desiros.